VietPress USA (June 11, 2018): Here in the United States is still Monday evening, but in Singapore the time scheduled for the historic summit between U.S. President Donald Trump and North Korea's Leader Kim Jong-un is now starting at 9:00am at Capella Hotel Resort on Sentosa Island in Singapore. 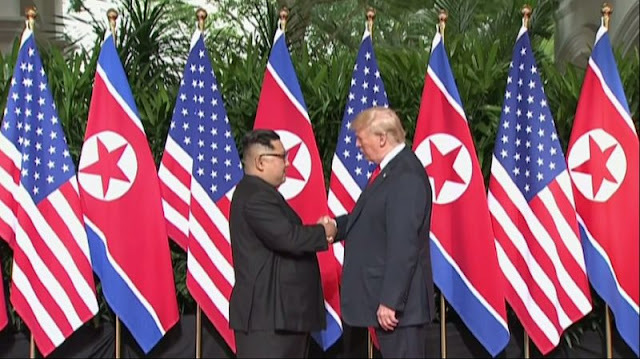 President Trump and Kim Jong-un shake their hands and face-to-face for the first time ever to negotiate the denuclearization in North Korea. After months of saber-rattling that gave way to flirtation, President Trump finally met face-to-face with Kim Jong Un at a hotel on Sentosa Island in Singapore on Tuesday morning. Shortly after 9 a.m. local time, Trump and Kim shook hands for about 12 seconds in front of a bank of 12 alternating U.S. and North Korean flags. After their initial greeting, Trump and Kim sat down and spoke briefly to reporters. Trump, who had insisted he would know “within the first minute” if Kim was serious about denuclearization, said he “felt really great” and that it was “an honor” to meet the North Korean dictator. The pair then retreated to a private room where they were expected to meet one-on-one, with interpreters, for approximately 45 minutes before an expanded bilateral meeting with advisers. He also revealed that his economic adviser, Larry Kudlow, who did not among the U.S. delegation in Singapore, had suffered a heart attack was being treated at Walter Reed Medical Center in Maryland.